The paper presents a country-wide trend analysis in seasonal air temperature, precipitation, sunshine hours and wind speed over the 1961–2013 period. Changes in annual temperature and precipitation extremes are also investigated by means of 14 indices recommended by the Expert Team on Climate Change Detection and Indices (ETCCDI). The air temperature and the number of sunshine hours present significant increasing trends in winter, spring and summer; the precipitation amount is rather stable, with increasing trends in autumn and decreasing trends in the other seasons, at few locations. The wind speed shows downward trends in all seasons, in agreement with the tendency of the terrestrial stilling. The annual thermal extremes show decreasing trends for the cold-related indices and increasing trends for the warm-related ones, with the warming signal being consistent over the region. The most striking results concern the number of summer days which is increasing at 95 % of the stations and the duration of warm spells increasing at 83 % of the stations. The annual precipitation extremes show mixed signals in all eight indices, with the majority of the stations presenting no significant trends. 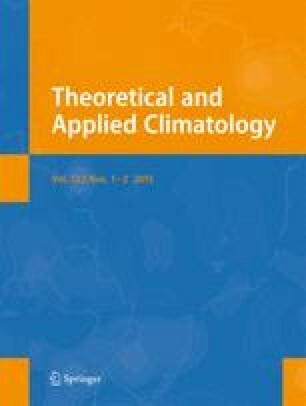 Our findings are in good agreement with recent studies on climatic variability in the region. We thank the two anonymous reviewers for their comments and suggestions, which led to an overall improvement of the original manuscript. This study was realised within the framework of the EU FP7 projects European Reanalysis and Observations for Monitoring (EURO4M) and Uncertainties in Ensembles of Regional Re-Analyses (UERRA). Lenuta Marin acknowledges the support of the strategic grant POSDRU/159/1.5/S/137750, “Project Doctoral and Postdoctoral programs support for increased competitiveness in Exact Sciences research” co-financed by the European Social Fund within the Sectorial Operational Program Human Resources Development, 2007–2013. The study on annual extremes was done within the project CLIMHYDEX (Changes in Climate Extremes and Associated Impact in Hydrological Events in Romania), funded by the Executive Agency for Higher Education, Research, Development and Innovation Funding (project ID: PNII-ID-PCCE-2011-2-0073).